Showing results for tags 'pinto'. Fuel evaporation from twin 45's? 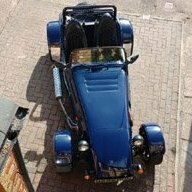 PINTO AND OTHER ITEMS FOR SALE I am currently converting my 2.0L Pinto engined Westfield from carburettors to fuel injection and have a number of components surplus to requirements. The car has covered around 2000 miles since built and everything for sale is in good serviceable condition. Everything was working when removed from the car. Pair of Weber DCOE 45 (152) Carburettors (No manifold) NOW SOLD These carbs were purchased new when the car was built and are a matched pair. They were fitted to a 2.0L Pinto engine with a Stage 2 cylinder head and ultimate road cam. They are jetted as follows:- . Chokes 36, Emulsion Tubes F16, Pump Jets 40, Idle Jets F8/65, Air Correctors 190, Main Jets 150 and Aux Venturi 4.5 Fitted with twin cable throttle linkages Air Trumpets (26mm) Includes mounting kit (Misab plates, Thackerey washers etc.) Also have some literature on set up etc. £ 450.00 (Includes UK postage) Collection of Weber DCOE 45 Jets, Tubes etc. (4 of each unless otherwise stated). NOW SOLD Some are new and unused. Others used for tuning. Air Corrector Jets	155, 170,180 & 200 Idle Jets	F8/60, F9/50, F9/55, F9/60 & F9/65 Pump Jets	45 Emulsion Tubes	F2 Auxiliary Vent Lock Screw (1 only) £40.00 (Includes UK postage) NOW SOLD. Webcon Carburettor Mesh Filters NOW SOLD Set of 4 low profile filters to fit trumpets of 63mm diameter. Good where engine bay space is restricted. £ 30.00 (Includes UK postage) NOW SOLD. AN-6 Weber Carburettor Fittings. NOW SOLD Made in black aluminium alloy and connected with short length of stainless steel braided hose. Swivel seal tee and single end. Sorry only one banjo bolt but obtainable on internet (around £13) or could use standard Weber banjos (M12 x 1.5mm) £ 35.00 (Including UK postage) NOW SOLD Aldon (Non vacuum) Distributor (Model 104FPRI) and Luminition Performance Ignition Kit. The Luminition system comes complete with ignition module, matched coil, connection leads etc and the distributor is fitted with the “windmill” inside the plug cap. Instruction sheet included. 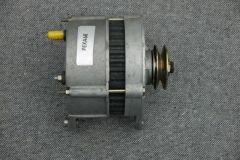 The distributor may not have been purchased from new and could be a bit older but was working satisfactorily when removed. £ 250.00 (Includes UK postage) Facet Fuel Pump NOW SOLD Complete with filter and short connection hose. (Low pressure type) £20.00 (Includes UK postage) NOW SOLD. Filter King Fuel Pressure Regulator (Carburettor Low Pressure) NOW SOLD Fitted with male AN-6 hose ends but easily changed to BSP barbs if required. Complete with mounting bracket and instructions. Also included is pressure gauge for use during initial set up (gauge adaptor required) £ 35.00 (Includes UK postage) NOW SOLD Will do my best to answer any queries. I have been unable to start my Westy after replacing the cylinder head and would appreciate any help to get it up and running again. 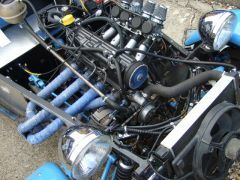 I have a Westfield SEiW with a 2.0l Pinto engine and twin DCOE 45 Weber carburettors. The bottom end is unmodified, save for a lightened flywheel and I decided to improve performance by adding a big valve cylinder head and uprated camshaft. I purchased a Stage 2 unleaded head and a Kent GTS1 camshaft from Burton Power. Burtons fitted the camshaft to ensure the geometry etc was correct. I removed the old cylinder head and fitted the new one without any difficulty and set up the valve timing using the Full Lift Before/After TDC Method as follows. Established TDC on No1 Cylinder Fitted Timing Disc to crankshaft pulley and set to zero degrees. Adjusted Auxilliary pulley so that distributor rotor pointed to No 1 cylinder Fitted and tensioned timing belt Released vernier pulley on camshaft so that it rotated freely Rotated engine clockwise by 108 degrees (the quoted value for full valve lift) Turned camshaft so that inlet valve on No 1 cylinder was at maximum lift Tightened vernier pulley Torqued everything up Turned engine over by hand without issue. But it refuses to start. I have tried advancing/ retarding the ignition slightly but to no avail. I have a healthy spark and fuel seems OK. I have run out of ideas and would appreciate comments on my methodology or anything else that I may have forgotten about or failed to do. Thanks in anticipation. Alastair. Westfield SEW Wide Body British Racing Green (2004) NOW SOLD!